Dallas Mavericks forward Dirk Nowitzki (41) celebrates with forward Jae Crowder (9) after a basket in the third quarter Memphis Grizzlies at American Airlines Center. The Mavs beat the Grizzlies 105-91. Dirk Nowitzki gave the Mavericks a boost in his return to the lineup, while the short-handed Grizzlies lost another starter to injury. Nowitzki scored 20 points after missing a game with a stomach virus and Dallas defeated Memphis 105-88 on Wednesday night. The Mavericks (15-10) have won two straight to equal their season high of five games over .500. Memphis (10-15) has lost five in a row and seven of eight. Nowitzki added six rebounds, five assists, two steals and one blocked shot. He scored four points during a 10-2 run after the Grizzlies cut a 16-point deficit to four in the third quarter. "I didn’t feel great Monday in practice," the 16-year veteran said. "We didn’t have a game for another two days, so by Tuesday I was a lot better and today I felt fine. I used the break to get healthy." Mavericks teammate Monta Ellis, who scored 16 of his 18 points in the second half to help squelch a Memphis rally, said Nowitzki didn’t look as if he hadn’t played a game in a week. "Even when he came back to practice, he didn’t look like that. He’s been in the league so long that he knows how to take care of his body," Ellis said. Jose Calderon, in his first season with Dallas, scored 12 points, including two 3-pointer in the second quarter. He said he was "amazed" by Nowitzki. "He makes everything look so easy. I was amazed how the guys guarding him kept jumping, and he just waited and knocked down the shot," Calderon said. While the Mavericks got their star forward back, Memphis was without three injured starters. Tayshaun Prince missed his first game this season because of a sore left knee, and the Grizzlies already were without point guard Mike Conley and center Marc Gasol. They dressed only 10 players for the game. Tony Allen led the Grizzlies with 16 points and matched a career high with 11 rebounds — 10 on the offensive end. But he left in the fourth quarter because of a cut on his pinkie that required three stitches. "I’m going to try to play (Saturday at New York)," Allen said. "I don’t want to sit out and do all that behind-the-scenes treatment." Grizzlies coach David Joerger thought playing short-handed might have caught up to his team when it lost the momentum of a third-quarter rally that reduced Dallas’ lead from 65-49 to 66-62. "We got an offensive rebound when we were down six and had a turnover. I should have probably called a timeout at that point. Then we miss a layup, they score and I do call a timeout when we are down 10," Joerger said. Memphis’ eight offensive rebounds in the third helped the Grizzlies go on a 13-1 run that cut their deficit to 66-62. Zach Randolph scored 10 points during that stretch and finished with 14. Dallas built the lead back up to 78-66 entering the fourth quarter. Memphis got no closer than 11 during the final 12 minutes. Vince Carter had 14 points for the Mavericks and Shawn Marion 10. Samuel Dalembert, who didn’t play in Dallas’ previous game, came off the bench in the second half to score eight points, grab seven rebounds and block two shots in 13 minutes. He also slowed down Randolph. "I liked the lift that Sam gave us off the bench," Nowitzki said. "He was phenomenal using his wing span to slow down Zach, and getting blocks and rebounds." Mavericks coach Rick Carlisle was able to change defensive tactics once he inserted Dalembert. "They were making a run. Randolph had gotten involved a little bit. We’d been double-teaming and fronting, and that opens up other things. We had Sam play it straight up. He was able to guard, his length was a factor, he rebounded, he blocked shots," Carlisle said. The Grizzlies shot only 17 for 47 (36 percent) in the first half. "We held them to 40 percent shooting (for the game). 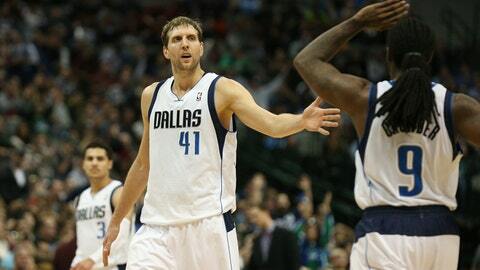 Any time we do that we put ourselves in position to win games," Nowitzki said. The Mavericks led by as many as 15 before finishing the first half with a 52-39 advantage. Three players did the damage in the second quarter, combining for all but two of Dallas’ points. Nowitzki and Calderon each scored eight, and Carter had seven. Nowitzki led the first-half scoring with 14 points, followed by Calderon’s 10. Allen also had 10, along with seven of Memphis’ 12 offensive rebounds in the half. "I thought Tony Allen really played a great game. When you get 10 offensive rebounds from the shooting guard position, that is working," Joerger said. NOTES: Conley (24 points), Gasol (23) and Prince (three) combined for 50 points in the previous meeting, a 111-99 Dallas victory on Nov. 2. Allen was scoreless in that game. … Mike Miller started in Prince’s place and scored eight points. Conley (bruised left thigh) missed his second game in a row, and Gasol (sprained MCL in left knee) was out for the 12th consecutive game. The Grizzlies are 3-9 since Gasol was injured.